This is a three year sponsorship term with an option to renew for two more terms. Cost is $2750 for the first two years increasing to $3000 for the third year. All prices are exclusive of GST. This is a three year sponsorship term with an option to renew for two more terms. Cost is $1100 for the first two years increasing to $1500 for the third year. All prices are exclusive of GST. Track signage at Shepparton Harness Racing Club reaches thousands of people at our meetings throughout the year and millions through Sky Racing's multiple racing channels. 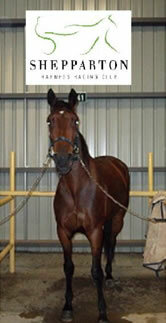 Please contact The Shepparton Harness Racing Club to negotiate a signage package to suit your needs. Signs (1200mm x 1200mm) to be supplied by the sponsor. All prices are exclusive of GST.